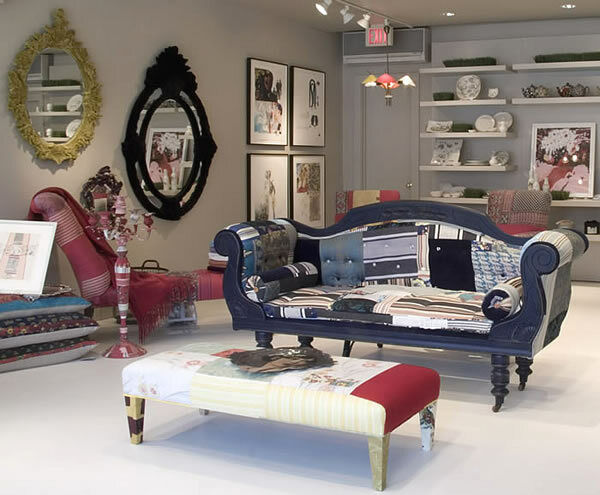 Gabriella told me about her new store in East Hampton, NY called j.roaman and the moment I opened the photos, I thought of decor8 readers and how much you'd love seeing this place. It's an eclectic blend of patterns from all over the world, all merged together to usher in a fresh, new look - a little different from the norm. Lots of bright colors and pattern, lively, fun! 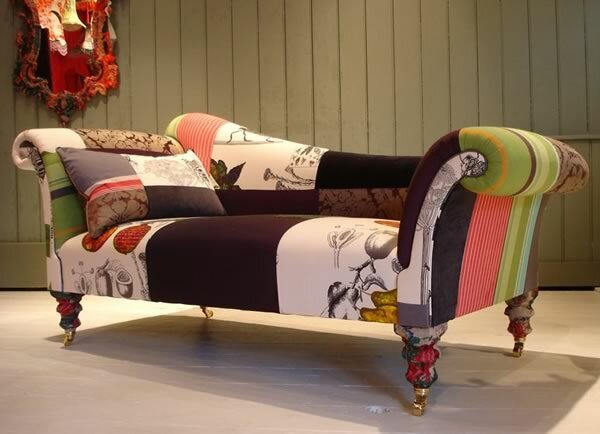 I've seen this look in Elle Decoration and Living Etc magazines, but I can't say it's a huge trend here in the states yet as the average American household isn't bold enough to go with patchwork bespoke sofas. Why be average?! Mix things up and have a little fun. 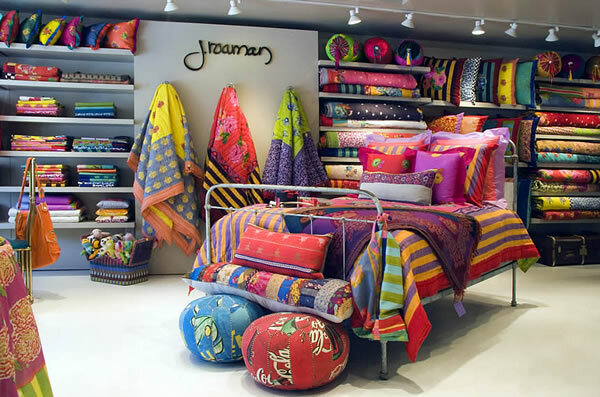 j.roaman offers one-of-a-kind custom furniture, quilts from Milan, tableware, art, soft toys, even Moroccan pouffes in unexpected prints (very unexpected!). Scheduled to appear in an upcoming issue of Oprah Magazine, Gabriella wants to give decor8 readers a sneak peek of their enticing selection. I don't know friends, looks like Fall '07 right into 2008 just may be the most colorful and pattern-filled that I've seen in a very long time! They don't have an online store, so I need to highlight the point of this post is more to inspire than to shop. Of course, if you find yourself in Hampton, New York you have to visit this place, but for the rest of us, look at these items as inspiration. 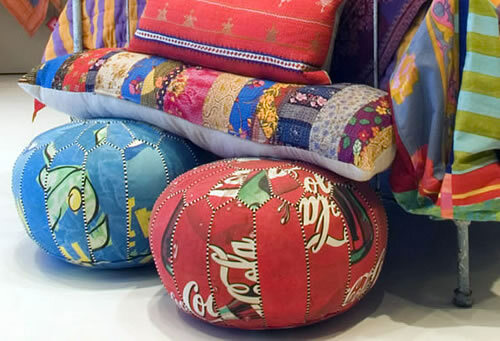 What can you recycle in your own home with some bold patchwork? These images may motivate you to do something interesting to an old chair, mirror frame, or foot stool, you never know... Recycle whenever possible, there are so many cool things you can do with a can of brightly colored paint and fabric scraps. From a recent trip to the Brimfield flea market, I found lots of vintage suzanis, some in not-so-good condition (a hole, some fading in spots, etc). This is a great alternative for vintage textiles that you love that you can't use as a cover - cut out the best pieces and use to cover furniture or to create bolster or throw pillows. Despite what some Interior Designer from Watch Hill, RI told me at Brimfield this past May, suzanis are hardly pass?. She was so against them, and I told her that nothing is pass? if you love it. She wasn't a big fan of my personal feelings about interior style, but I still shared them with her. And the more I see suzanis in magazines and stores, the more I'm thinking that they aren't pass? at all. 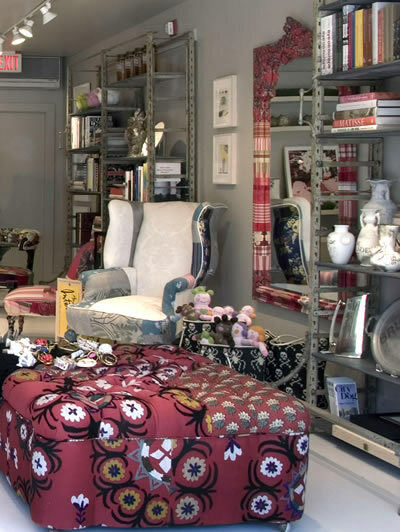 Thanks Gabriella for the tip and the great store images! Little Doodles - Launching 8/7!